Some really helpful points from the team (#teamhaem on Twitter). This child presented to the emergency department with severe burns after an accident with boiling water. Phlebotomy was rather difficult, leading to rather poor sampling. Paediatric sampling can be difficult and sometimes results may not be perfect, but this is where clinical correlation is vital. We thought the platelet count was lower than 121×10*9/L due to the machine counting the red cells as platelets. The sample was repeated the next day and seemed more accurate and a review of quality control was instigated. What was important was the communication to the clinical team. Microspherocytes can be seen in severe burns. Patients are frequently hyponatraemic and hyperkalaemic. The film features fitted with the patient. The FBC was normal previously. Diagnosis: Microspherocytes due to severe burns. 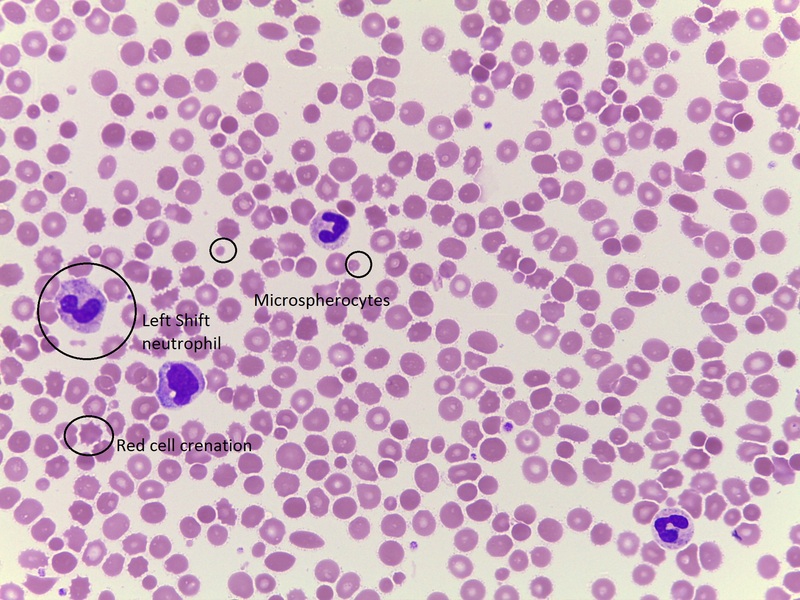 This entry was posted in Laboratory morphology, Paediatric haematology, Related to other specialities and tagged Blood film, burns, microspherocytes. Bookmark the permalink.